Just a little sneak peak of some of the things I'm working on for my commissions. I will be posting completed shots of these companies as I finish them for my clients! If you yourself are interested in commissioning something from me, do not hesitate to shoot me an e-mail (MittenNinja@gmail.com), I am more than happy to answer any questions you may have. "Welcome to the 31st OMU recruit! As a new member of the Resistance Militia on Orion 6 you need to be knowledgeable about the fascist scum that you'll likely be pointing your rifle at. The regular UMFL grunts out in the badlands shouldn't give you too much trouble, it's those damn snakes you should be really worried about. 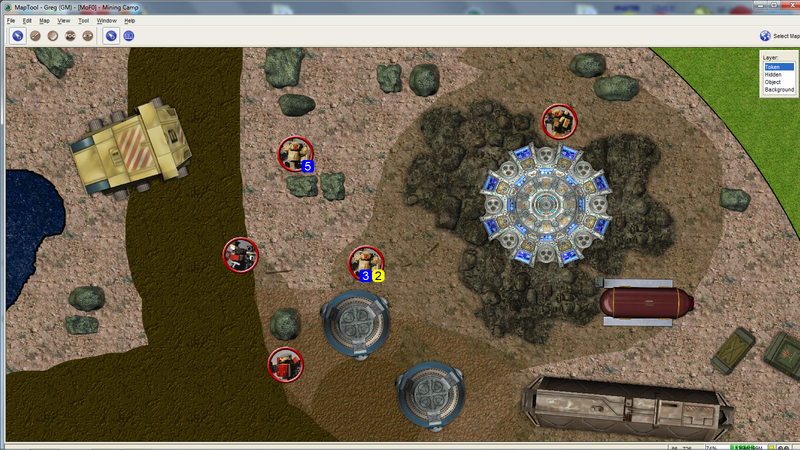 They're all hardened veterans, but sometimes you can gain an advantage by taking out the commanding officer. It's not going to make these grizzled warmongers retreat, but it might give you a moment while they regroup to change the tide of the battle. There are a few nuances to the command insignia, but if all else fails the one with the most green is the one in charge!" Soldiers ranked at either private of specialist do not wear any special colors. Privates are assigned standard loadout frames and make up a majority of the Serpent Legion forces seen on the field. Specialists only differ in the way of gear. They are usually given more freedom with the loadout of their frame to fit with their skillset. Low ranking officers wear a splash of dark green on the left side of their frames. This can either be on the shoulder, or left side of the torso, but not both. These officers are generally given free-reign to loadout their frames with any standard issue equipment available in any configuration they choose. As we move up the chain of command, the command color switches from the left, to the right side of the frame. Again, this can either be on the torso or shoulder, but not both. Lieutenants are sometimes given non-standard issue or even prototype gear to use in combat. Moving up to the Captain, the command color returns to the left side, but now the head is also green. The coloration of the head signifies a new rank increase while the coloration returning to the left signifies a lower rank in that "tier". These officers can carry nearly any range of gear, so be careful. Moving Further up the chain of command continues the same pattern. A Major would be the same as a Captain, only the color would move to the right side of the frame instead of the left. Colonels have both the torso and shoulder colored on the left in addition to the head, and Brigadier Generals (in the rare instance that one would actually be on the field of battle) would have both the right side of their torso and right shoulder colored. "You got that recruit? Remember it! It could save your life out there! Now go make sure that new Meerkat of yours in in tip top shape! The last thing you need is an actuator jam in the middle of a firefight." As some of you may have noticed, I have been more or less absent from the forums, IRC, and here on the blog as of late. Don't worry, I haven't died, come down with a severe illness, or run away to Costa Rica with a crate full of fine peaches. I'm in the process of filling three commissions at the moment and between the other aspects of life it's keeping me rather busy. As I complete the commissions I will be posting shots of them here so you guys can see them! So stay tuned! So I've started a build challenge over on the forums. It's called the "Triple T Challenge," and you must build a frame using no Travis bricks, Taps, or T-pieces. These three parts are extremely common in frame building and I thought it would be fun to see what everyone could come up with when they're forced to use other more interesting parts. Here's my build for the challenge: The RT-06 Bullfrog. Let's see what you can come up with! Start building and post your creation over on the challenge thread on the forums! 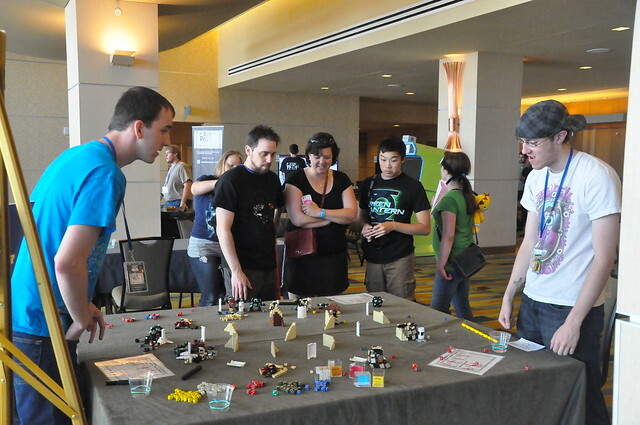 After playing numerous games of MFZ at the Denver Comiccon last weekend, I got a first hand look at how certain builds and tactics play out on the table. Out of all the games played, the OMU won all but 4 with the Pit Vipers winning 3 and the Rattlers winning only 1. Part of this I attribute to the fact that nearly everyone who played a game at the table had never played MFZ before and both the vipers and rattlers require certain tactics and playstyles to win while the OMU just has to not lose anything. The games where the Vipers and Rattlers won were because they effectively used coordinated and deadly attacks, making good use of spots and focused fire. At first glace, the lack of yellow dice on the Rattlers seems like a huge hindrance, in practice it isn't as debilitating. The amount of firepower they bring to the table tends to eat through cover quickly and paired with increased mobility (every frame has a green die) they are able to maneuver around cover to line up a good shot, which means they are often able to use their white dice to lay down spots for their allies. The snipers hung back and layed down some hurt across the table. There was only one game where they ever got touched (granted that one instance it got one shotted by a salvaged chub's hatchet with 11 damage dice) and they were rarely anywhere near close enough to the thick of things to be a serious target. The Vipers had the advantage of versatility. They had solid firepower all around (only one frame didn't have a d8 for attack) as well as two frames with double yellows. This meant they had some heavy attacks that could be very effective if focused correctly. The Iguana Grunts were awesome assault frames, swooping in quickly and dishing out the hurt while the Longbow peppered them from afar, assisting with spots wherever needed. The Blitzer hung back by the stations and used it's SSRs to pepper any incoming frames before they got in range of his huge melee damage, all the while supporting the reast of his team with his yellows. What did I (and should you) take from this? One defense system can make a huge difference in how long your frame stays on the table and contributing to the fight. It may not seem like a sound investment on paper, but trust me, it is. Yellow dice are useful, but not always necessary. If you have the firepower to chew through cover or the mobility to get around it, your white dice will do just fine. Make sure you activate your frames with yellow dice before your last frame. Those spots wont do any good if you don't have anyone left to use them. Be aggressive and coordinated. This doesn't mean be reckless, the team who attacks relentlessly and effectively will almost always win. Pit Viper Assault Chubs shake down an OMU soldier. The first Denver Comic Con was a HUGE success. As a first year con, it pulled in over 20,000 con goers (not including kids under 10, and there were a bunch of those there too) over the weekend, which is over double the projected attendance. Every exhibitor, celebrity guest, and professional that attended was gushing over how well the event was run, and how much fun it was and that they would love to come back next year. On top of that, already on the guest list for next year's con is Stan Lee and Mr. Wheaton (he had to cancel this year due to a huge movie gig that he can't currently discuss due to NDAs). Based off of people's reactions this year I wouldn't be surprised if the con is twice as big next year. But enough about the con itself, and on to MFZ! I was set up in the gaming area in the Hyatt across the street from the convention center all weekend. I had a sweet spot right next to the entrance of the gaming area which meant everyone that came in saw the table. I was actually really surprised how many people that stopped by had asked "Hey, is this Mobile Frame Zero?" Nearly every person that walked by was floored by the concept, and every person that sat down and learned how to play was impressed and had tons of fun. I even had a handful of people come back the next day for another game! You can find lots of pictures of all the MFZ that went down on my flickr stream or Ben Kim's (Thanks for swinging by each day and taking lots of pictures Ben!). Denver Comic Con starts today! Keep an eye on my Twitter and Flickr Stream for pictures from the chaos that will ensue all weekend long! And if you're in the Denver area come on down! In the next week and a half or so I'm going to be incredibly busy. I'm moving into a new house, getting things finalized for Denver Comic Con, and working 10+ hour shifts for the next nine days. So don't expect to see much of me in that time period. However, immediately after the nine day stretch I'll be running MFZ demos over at the Con, so expect to see plenty of stuff that weekend! I put up a poll to ask what you want to see out of my coverage of the con, so please let me know! In the mean time I'll leave you with the progress so far on the newest frame I've been working on, the Kimodo. Denver Comic Con is almost here! In just over two weeks time, the first annual Denver Comic Con will be upon us. They've got an amazing set of celebrity guests including some of the cast of the Walking Dead (Steven Yeun, Lauren Cohan, and Chandler Riggs), Whil Wheaton, Kristin Bauer (True Blood), Michael Uslan (Exec. Producer – The Dark Knight Rises, The Dark Knight, Batman Begins), Billy West (Futurama, Ren & Stimpy, Looney Tunes), Tom Kane (Star Wars: The Clone Wars, Wolverine and the X-Men, The Powerpuff Girls), Jasika Nicole (FRINGE, She’s Out of My League, Take the Lead), Mark Ryan (Transformers), Steven Seagle (Ben 10, Generator Rex, Ultimate Spider-Man), and Greg Weisman (Gargoyles, The Spectacular Spider-Man, Young Justice). Exciting new comic book guests include Eisner Award winner Georges Jeanty (Buffy The Vampire Slayer), Amy Reeder (Batwoman, Madame Xanadu, Fool’s Gold), Mike Grell (Green Arrow, Green Lantern, Action Comics), Peter Gross (Unwritten, Lucifer, Book’s of Magic), Ethan Nicolle (Axe Cop, Chumble Puzz) and Golden Age artist Allen Bellman (Captain America Comics, The Human Torch, Sub-Mariner Comics) among others. Not only that, but I will also be demoing Mobile Frame Zero at the Con all weekend. I'll be in the gaming center over at the Hyatt (across the street from the convention center) and will be playing games, teaching newbies, and discussing everything else until no one wants to come see me anymore. If you've got a company bring them down and play your company against one of mine! Or someone elses! Who cares! LETS PLAY SOME MFZ! After being involved with some of the training and set up for the Con, this is looking like it could easily rival San Diego in a few years, I highly suggest coming out if you can! After discussing at length the idea on the forums and looking at the results of the poll, I've decided that doing a frame store in the typical sense just isn't viable. The time and money involved to put something together that would be efficient and desirable would not yield anywhere near enough profit to make it worth the large amount of time invested. However, I am willing to take commissions for custom frames and companies. This is much more viable as I wouldn't have to keep frames on hand and I can design/build on a case by case basis determined by the budget of the buyer. Not only that but I feel it would be much more fun and rewarding for me to do something like this over a cookie cutter frame store. If you're interested in a MittenNinja designed custom company (or individual frame) shoot me an email at MittenNinja@gmail.com. Let me know what you're looking for, what budget you're working with, and we can see what we can whip up! The Grizzly: It's got fists for pummeling. A-Yates Industrials. If you haven't been over to his Flickr stream you need to go have a look. I've had a few of his builds on the blog in the past, but man, he has a lot more to offer. His APF-90 frames (pictured left) are simple yet incredibly detailed. I absolutely love the feel these guys have. His MINX frames give off a burly vibe with their squat silhouettes. The Growlers ooze style, and builds like the Jak Ra33bit and the Goat have tons of personality. Keep up the good work man! After discussing the idea with a local lego vendor, I wondered what the viability of selling pre-built frames to MFZ-ers would be. So, with that I have set up a new poll. Would you be willing to purchase pre-built frames instead of ordering the parts yourself and building them yourself? If so, what kind of price range would you be willing to pay? I only ask this because If there is enough interest I would be completely willing to start up such an operation. Let me know what you think! Onosendai2600 has done something absolutely incredible. 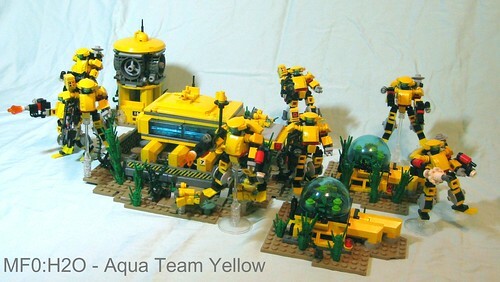 He has built three MFZ companies all with an underwater theme. Above, you can see his "Aqua Chubs" hanging out around their underwater base. I absolutely love the look of these, as well as the idea behind them. It's not hard to imagine frames taking positions on an aquatic world, fighting off aliens and monstrous sea creatures alike, but after seeing what he has put together, I can't wait to see what else he has in store for us. If you check out his Flickr steam, you can see the other two companies, Team Crustacean, and Team Mollusk. With the Denver Comic Con approaching on the weekend of June 15th, I've been putting the final touches on two of the three companies I will be bringing with to demo Mobile Frame Zero. The third is a company being built by Soren which is shaping up rather nicely if I say so myself! I still may be tweaking the companies a bit here and there, but this is two thirds of what you can expect to see on the game table out at Con! Hope to see you there! The ST-09 Iguana is one of two standard issue frames in use with the serpent legion (the other being the ST-07SLC "Fat Snake" Chub). Being a common frame in the Legion, it needs to be adaptable to multiple battlefield situations, which means there are a number of "standard" variants of the Iguana being fielded. Below are two of those variants. Wordman came through yet again and put together Ldraw and PDF instructions together for the Copperhead I had put together a while back. If you haven't already, check out the rest of his work too! Thanks again man! Thanks to Wordman over on the Mobile Frame Hanger Forums, there is now a lovely little Ldraw file and pdf building instructions for the Serpent Legion's newest prototype. He has also been putting together a number of other files for builds on the forums. Make sure you go check them out! Over at the Mobile Frame Hanger Dukayn has been putting together some really badass wallpapers of some of the frames people have been putting together, including the ST-09 Iguana! He's also taking requests so if there's something you'd like to see rendered in 3d and made into a killer desktop wallpaper head on over and let him know! Thanks Dukayn! First off, I'd like to apologize for the inactivity here over the past week or so. A combination of work and starting the process of buying a new home took up my time for a bit. With that, I'm going to be starting a new thing over here. Instead of just giving you a single breakdown shot of some of my builds, I'm going to be putting together a detailed breakdown with some setting fluff on their origins and current use. We'll start things off with the XF-13b Grand Naga. After the riots on Quall, the Union became increasingly concerned with engagements dealing with close quarters urban environments. The Serpent Legion made finding a weapons platform to fit within that situation a high priority because their pilots were being deployed in similar situations with increasing frequency. The Skunkworks began designing a mobile frame from the ground up to give Legion pilots an edge. The result was the Grand Naga. The first of my "cheats" for this build. First things first. There are two "cheats" in this build that involve disfiguring some parts. Purists may scoff. But hey, I think it looks sweet, so I'm going to do it. Also, this is a very travis brick heavy build. There's 12 of them if you include the one in the shotgun, so don't be surprised if you start running low after building a few of these. Let's begin the build with the legs. This is where my first "cheat" comes in. As you can see I've cut one of the tires to wrap it around the rear travis brick, with the radar dishes on the side creating the illusion that the tire goes into the back of the heel of the foot. That travis brick connects to a headlight, and then another travis, creating the foot. The ankle is one of the sturdiest connections you'll find while maintaining a good amount of flexibility. The only downside is there is no horizontal movement. Next, the torso. As you can see, the central core of this is from Squieu's brilliant mini-frame. The motor piece (#4595) at the center is a wonderful place to start for torsos due to the large amount of studs hanging off it and the fact that it is also a very common piece in my experience. Three more travis bricks make an appearance here as well as some plates, cheese slopes, and tiles to complete the look. This section of the frame is also very, very solid. There is little to no wiggle anywhere and the only piece that feels like it may fall off in any means is the 1x2 hinge piece on the crotch. The legs attach by plugging the taps into the travis brick at the bottom of the torso. Next we move to the arms. The tire technique here is something I use quite frequently due to the fact that I absolutely love how the matte, rubberized black breaks up the look of the frame beautifully, while adding a rounded aesthetic that is rather hard to achieve with standard brick usage. The arm attaches to the tap via a 1x1 plate w/ ring. This technique is something I've used a number of times with frames like the MkII Meerkat. It's a sightlier fragile connection without being too flimsy, although it gives you a lot of options for posing the arms. That plate is attached to a headilght piece and a travis brick (bringing the count to 11 with both arms at this point). Then come the standard issue weapons. We have a Molecular Blade and a Tactical Shotgun (which can be seen in more detail here). The shotgun contains the 12th travis brick of the build and could easily be used as a grenade launcher or really any number of other weapons. Bringing it all together gives you a near complete Grand Naga. There is just one more piece missing, the top. This is where the second cheat comes in. It involves cutting the ring off of a 1x1 plate w/ring and placing them into the top of the motor piece of the torso. If you're against destroying a couple of pieces, you could use 1/4 pins, although the connection isn't anywhere near as solid, and there is a bit more of a gap between the torso and the top slope. Now you have a completed Grand Naga! The XF-13b Grand Naga is currently in the field testing stage with the Black Adders, commanded by Captain Uri Reed on Orion 6. So far, they have been invaluable tools in subduing and eliminating the Free Colonist Terrorist movement on the planet's surface. Assuming continued excellent performance, these Nagas may be seen on the field in standard production within the coming year. Things have been rocking over on the Forums over the past week, but otherwise there hasn't been a whole lot of activity as Josh and Vincent are finishing up the rulebook. I've been a little lax on keeping up with all the stuff going down now that I'm searching around for a house to buy as well. So things may be a little slow for the next week or two on my front as well. That won't stop me from continuing to build though! The Hellraisers dont have any qualms about making modifications to their frames that might be considered dangerous. Above you can see an "Inferno Wasp" one of their makeshift jump pack equipped raiding frames. I pity the convoy that is surrounded by a swarm of these. Cpt. Angelo is the commanding officer of the 31st OMU. He likes guns and peaches. Over the past week or so, there has been some serious discussion over on the forums. Thanks to Vincent (aka Lumpley) we have damn near all of the rules for MFZ. This post contains the rules for setting up the battlefield and getting things started, as well as links to all of the other discussions about the rules on the forums. So what's left after knowing how to play? Building and setting up your company! There's a discussion on Company Builds, different Weapon Loadout Theories, and Battle Simulations. I highly suggest getting in there and reading up, not only can you jump in the discussion, but the guys who made the game are putting in their two cents too. Plus, they'll be using this feedback to help finish editing the rulebook. thomastamblyn has put together some frankly stellar little designs. The Hobbes and the Habermas bring back memories of playing Mechwarrior 2 in my dad's basement, and he's got breakdowns of them both on his flickr stream. I know I'm going to be using some of his designs. Take a look at some awesome Hi-Leg variants with corresponding support drones by Mance Haines here, here, and here. The drone idea is something I've been working on as well and it's awesome to see someone else doing it too! Round, bubbly, slick looking tachikoma inspired quadrupeds. That's what MFZeroRA has been cooking up. I avsolutely love the reactor station that c0dmonk33 built. The sniper rifle on his chub is pretty slick too! Pasukaru76 knows how to put together some friggin awesome looking legs. Look at those ankle joints! Genius! A YATES threw together a Zizy inspired frame called the MINX. The posture on the thing is sick. The news front is rather slow since Soren and Josh are either moving and/or getting married (congrats!) and they are in the process of getting things together to publish. That means all the discussion is going on over at the forums. There's some great rules previews, discussions, background and setting info, and last but not least a very active "forge" for new custom frames. GO LOOK! New Poll up later today! ground to find his target. I've been thinking that I need a place to store all of the information for this setting that's a bit more organized than a blog form. Thus, I've started a thread over at the Mobile Frame Hanger to serve as a reference for Orion 6 and all of the fun info that is associated with it. I will still continue to flesh things out here, as well as post builds and news. But if you want a overview of what the setting is all about, head over to the forums and have a look! On Orion 6 it's not just the colonists and the Solar Union at odds. There are many other, smaller groups who have vested interest in the ores underneath the crust of the planet. One of these such groups is the Hellraisers. By the common man's standards they are insane, bloodthirsty, and vicious. But if you were to ask one of them (not that anyone has) they'd tell you that the rules of society that are thrust upon the people are unjust, even oppressive. The Hellraisers started out as miners, just like everyone else on Orion 6. After a few months of heavy mining there was a cave in, trapping multiple miners deep underneath the ground. A majority of the colonists (including the foreman of the operation) decided that a rescue was a lost cause and they would not waste the resources trying to save dead men. The handful that disagreed were not the type to sit idly by and let their friends suffocate in a dark hole. The foreman tried to prevent them from going, with force, and they returned in kind. The resulting conflict was bloody, but the miners got to their trapped comrades in time to save them. In the aftermath, the colonists put out a warning against these murderers, they were to be brought in dead or alive. Instead of trying to hide within the cities on the planet, they ventured into the badlands and forged their own society. 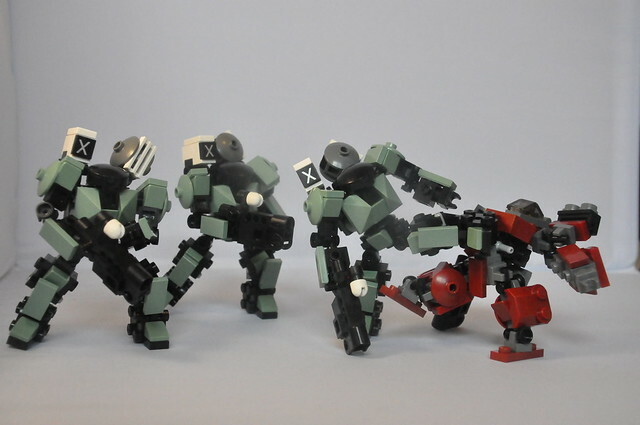 Completely unrelated to the Hellraisers, some Military Police hardsuits based off of Tiboblok's design. And here's your weekly rundown! 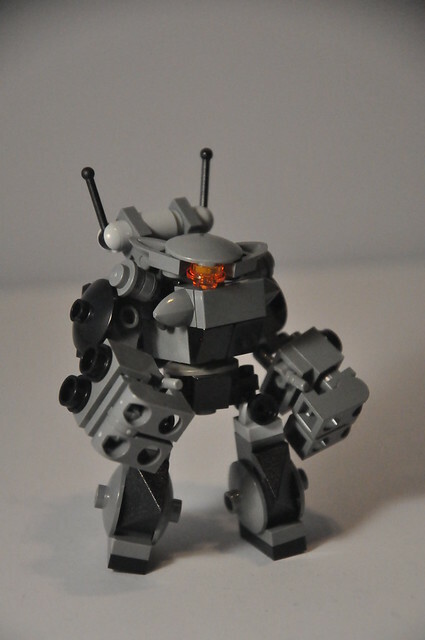 The MFZ Flickr group has been blowing up with builds lately! Here's a few that in my opinion stand above the rest. Golden Meanie has put together some really cool terrain Here and Here. I'm definitely going to be taking some inspiration from those, especially how they nest with each other for easy storage! 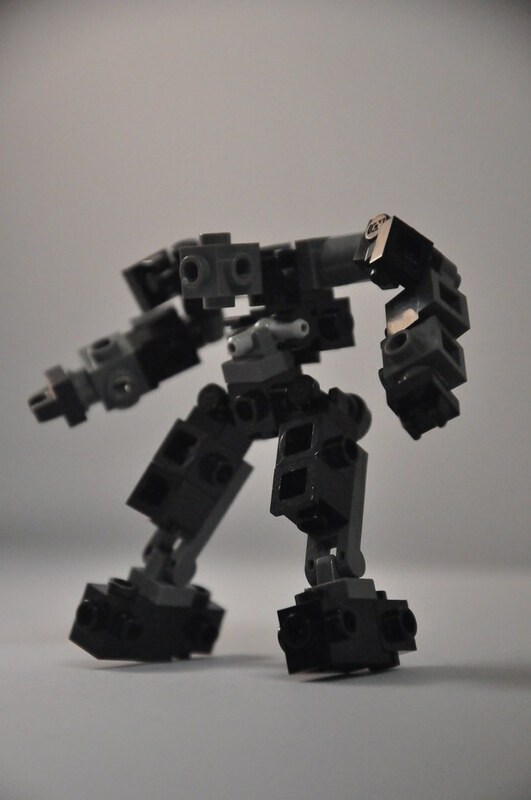 BobMFZ is putting together some really slick variants on the Chub and High-Leg. I really dig the gun on that chub. Remember those racecar inspired mechs from sagethe13th? He's posted some breakdowns of them here and here. tiboblok put together this really badass comm tower for use as a station. 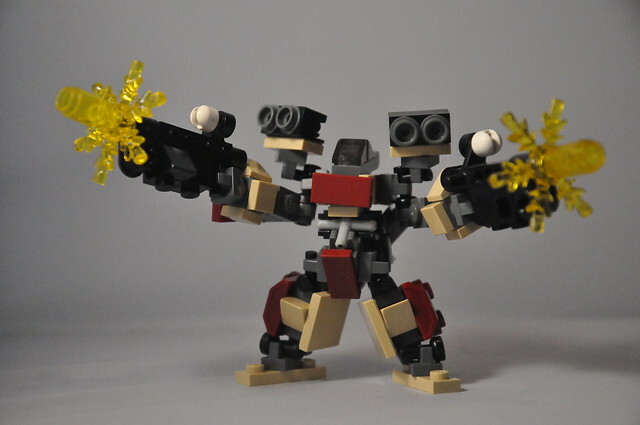 triple_ought's Ogre frame is not something I'd like to run into in a dark alleyway. and A Yates has a couple of really slick looking stations too. The poll is done! The Serpent Legion thanks you for your support and cooperation. And the new poll is up! And we will leave you with one of the newest prototypes from the Serpent Legion Skunkworks! Keep those muscle cylinders warmed up! 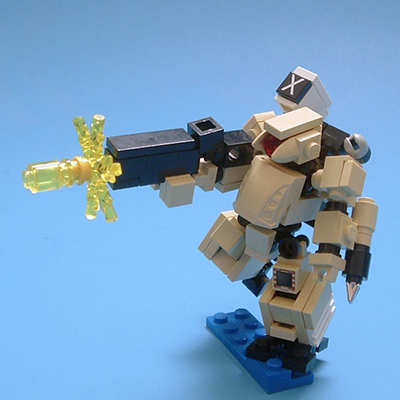 use as a makeshift combat frame by some resistance members. Empires put a great deal of energy into their expansion. It gets harder and harder to expand but, of course, Every linear expansion of the empire brings an exponential increase in the costs. It's just not clear what those costs are. The Solar Union is a 20th century-style soft empire. The colonies don't technically have their goods stolen; they sell them to the SU. But the SU hasn't allowed them full participation, in that they're straight up poorer. So the SU sets a "fair market price" and will only pay that — or at least "recommends" it to the corporation in charge of a particular expedition. On Quall, that corporation backed up that price with force. It's a price the SU can't afford to exceed and the colonies can't afford to get because, locally, the value of those goods has skyrocketed as they exhaust them, either by using up rare resources of by being unable to produce more without further investment. The "abandonment" phase comes when a colony's resources have become worthless on the market because other, newer colonies are better at producing those resources. That means older colonies can't trade the goods they have for the goods they need. The Free Colonies have started setting up a parallel economy, the existence of which is a direct threat to the SU's power structure. It will have (is having? How's this going on Orion 6?) the effect of increasing the prices of the goods the SU needs because there are other buyers — other colonies. That's a direct threat to the SU's ability to continue to feed its people. Transit gates are like little colonies, yeah. Think of them as port towns; reliant on shipping for all of their goods but those produced by their immediate neighbors. When you use a transit gate to send matter or data to another solar system, it's pretty imprecise. You probably don't exactly hit orbit. And you sure don't want to try to get so precise that you lit atmosphere because who knows what your incoming velocity will be. So you go for moon distance and see what you get. Having another transit gate at the other end makes it far, far more precise. A solar system with a transit gate can bring in materials bound for any body in that system. They take years to build, yes. When a colony is established, it's the first thing a colony has to pay for. They have to feed and equip themselves, too. So they start off in debt, but with the promise of riches of their newfound colony. They start producing to get out of debt, then find the value of their output dropping, and still have to support the colony, its expensive transit gate, populated and operated by locals but policed/defended by the Terran Transit Marines. I'm sure some colonies are now considering scrapping their transit gates for the resources they contain, which furthermore makes attack less practical, but eventually those colonies will be lost to history, unable to even communicate between the stars. To answer the question of how this is going on Orion 6: Things are getting messy. The sheer number of valuable resources on the planet has kept the cost of maintaining a Union presence within acceptable levels, while the abundance of materials that the colonists can trade to the newly formed Federation is high enough where they can get the supplies they need to fight for their independence without too much trouble. MFZ has been officially kickstarted! The Kickstarter has finished with a final count of $82,499! First off, congrats to Josh, Soren, and Vincent for putting together such a wonderful game that has gathered so much support from this exploding community that is developing! I'm happy to be a part of it. Secondly, There has been a recent avalanche of cool stuff being put together as backers are now getting those pick-a-brick and bricklink orders in. Let me take a moment to give you a quick mid-week rundown of some of the cool stuff that's been popping up. Sagethe13th has put together a pair of really badass frames with racecar inspirations. Micah Bauer is still at it with his brilliant C6 system. His latest creation being a bit larger and more detailed. 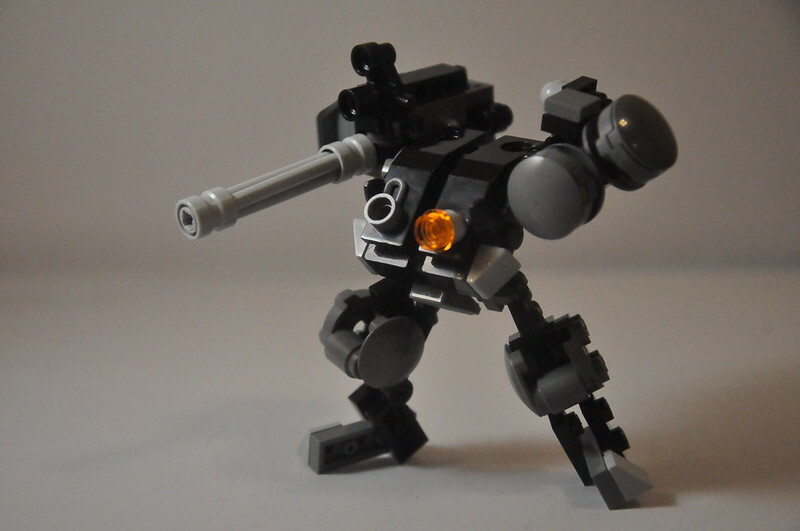 MacLane's tiny little missile bot is one hell of an artillery frame. A Yates's Badger has a really badass torso, and LOOK AT THAT GUN. And Malcom Craig yet again puts together a phenomenal frame. Joshua also spilled the beans on the Serpent Legion's Special Custom Chub in his last update. The ST-07SLC "Fat Snake" designed by Soren. Soren is designing a few more of the Serpent Legion's frames and I'm excited to see what he comes up with. I'll be sure to post them here when they're finished! Here's the rundown on my latest addition to the Serpent Legion's war assets. I built this guy using the core of a Squieu Mini-Frame and and the torso is inspired by Malcom Craig's Lansen. I've been keeping with my tire kick by working them into the guns on the arms. 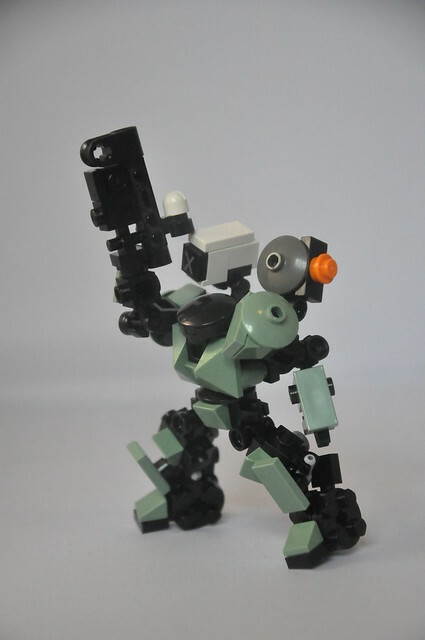 Micah Bauer has thrown together a few more awesome C6 frames, the Heavy Ordnance Tactical (HOT) Frame, the Combat Armored Biped (CAB), and the Quad Legged Armored Walker (QLAW). He has also been kind enough to put together a very cool looking list of all the C6 pieces. 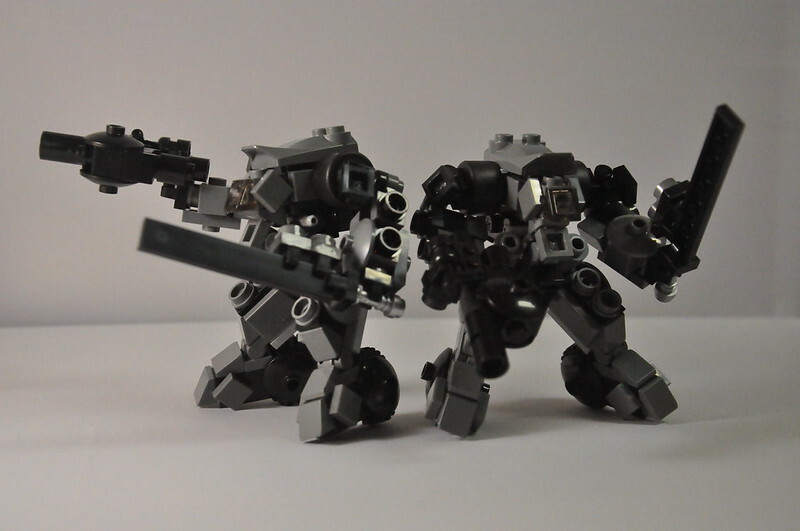 Zeekhotep has a bunch of really cool builds going for his Crimson Commandos on his blog. Ironsniper has put together what I think is a stunning little frame with a frog on it's head. Tetrajak has put together a stellar frame with some really cool joint work. And DrWatsman is up to his old tricks again. MFZ was at PAX East over the holiday weekend. 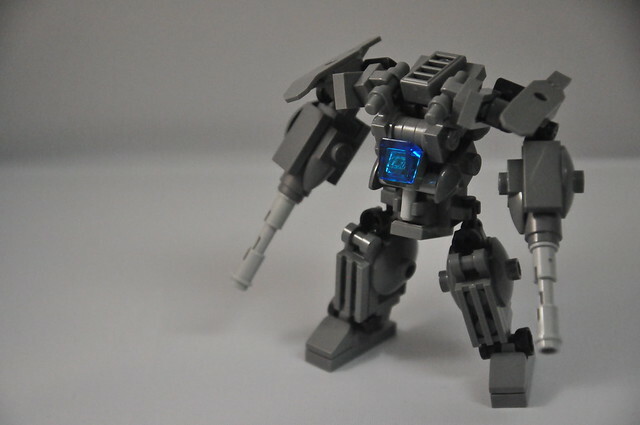 MantisKing has a brief rundown of the MFZ related events that transpired on his blog. Also, the Kickstarter project is about to hit $70k!! Congrats to the entire MFZ team! Since the arrival of the Serpent Legion on Orion 6, the usual converted labor frames and makeshift weapons were not enough for the resistance militia to hold their own. A group of engineers came together to create Orion Heavy Industries in the hopes of building mobile frames for the militia to push the Solar Union's forces out of the Orion system. 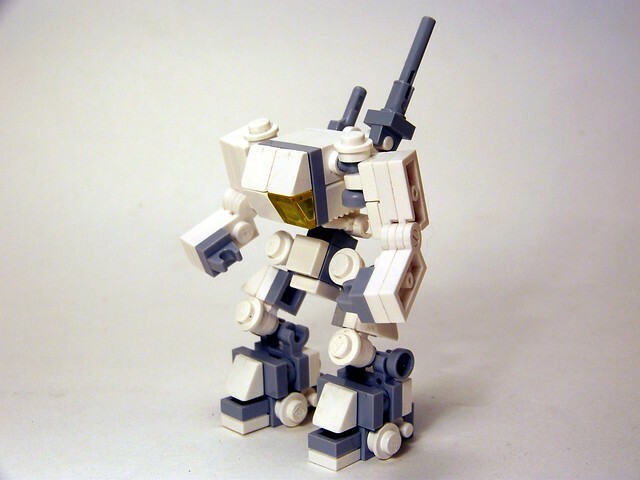 After reworking the Meerkat that had been used by the Trident in the initial battles with the UMFL, they began working on a completely original design, the Hunchback. 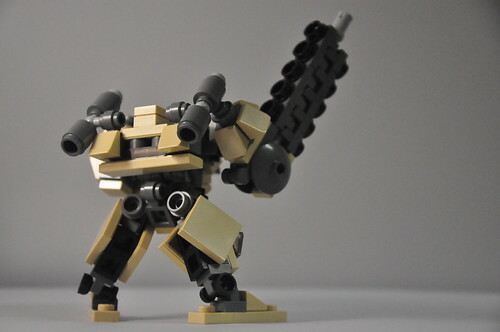 The militia had a dire need for a front line combat frame with solid firepower, durability, and the ability to coordinate attacks with it's squad. Orion Heavy Industries delivered. The OHI-04 Hunchback is an extremely durable and reliable frame that uses parts from mining labor frames at it's core. On the outside however, is a plethora of composite armor plates, two high velocity, high rate-of-fire sub-machine guns, and a communications uplink to give other militia members a bird's eye view of the surrounding battlefield. So as many of you have seen, one of my more recent creations is the X13b-Grand Naga (Seen Here). I've finally taken one apart and took some shots of the barebones frame so that all you wonderful MFZ fanatics out there can try your hand at building one of your own (or your own kickass variant). So here ya go! If you do something with this, please let me know. I'd love to see it! Climate: Arid with temperatures ranging from 125 degrees Fahrenheit during the peak hours of sunlight during the summer and dropping to roughly 70 degrees Fahrenheit during the night in colder months. Terrain: Large deserts and badlands. Very small amounts of vegetation and water volume. Settlements: There are four major port cities on Orion 6, each is a mecca for trade, legitimate and illegitimate alike. Current UMFL Presence: At this time, the UMFL has 2 major firebases and multiple outposts scattered throughout the planet's cities. The only major city with no UMFL presence is Niflhel, which is the headquarters of the Orion Milita and home to many of the Resistance Cells that operate across the planet. The Orion Militia has begun production of dedicated combat frames in the past year. The most common of these frames is the mkII Meerkat. 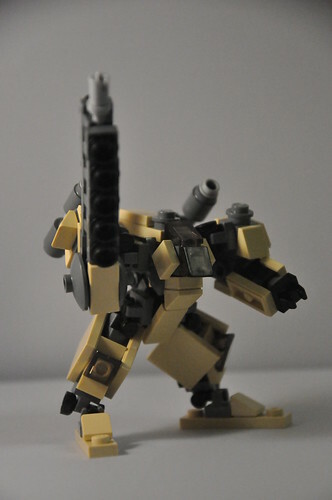 While similar in loadout and combat capability to the UMFL's ST-07 Chubs, the Meerkat ditches extra armor for additional speed making them ideal for hit and run tactics. These are extremely versatile frames pilot, do not underestimate their capabilities. The Legion is not your typical UMFL division for a number of reasons. The largest reason being that it technically has no ties to the UMFL whatsoever. As it is privately funded, the Serpent Legion is the known galaxy's largest PMC. Who funds such a high-tech, elite army? No one knows his real name, but he is known as the King Cobra. The King controls the Legion from the shadows, issuing orders to his three Division Generals who are in command of Python, Viper, and Rattler Divisions. Each division is in command of roughly 750 mobile frames, 6,000 infantry troops, and 150 armored vehicles, although generally most of those forces are stationed within the Sol system. Much smaller numbers have been deployed to the colonies. In fact, there are only about 500 known Serpent Legion frames outside of Sol. Most needs of the Union are met in the colonies by the UMFL. In the rarer cases when the UMFL is not suited to deal with the task at hand, an appropriate number of Serpent Legion personnel and assets are requisitioned to achieve results. As one would imagine, forces like these do not come cheap. It is commonplace for the Serpent Legion to set up a forward production facility on planets where lengthy operations are to take place. The Legion prefers to construct a majority of their assets onsite to avoid the costs of transport. Experimental and Prototype frames (like the Grand Naga, pictured above) are psychically sent through the gates to avoid the potential threat of their schematics being stolen by resistance members. Even if someone other than the UMFL could afford their prices, it's very unlikely an agreement would be made. The King Cobra keeps himself and his organization closely allied with the UMFL as much politically as militarily. The Serpent is devout in it's desire to eliminate the terrorist threat of the Federation and the similar minded Free Colony Resistance Cells. Very little else is known about the going-ons within the organization and it is widely suspected that there are a number of shady deals being done by the King Cobra behind closed doors. But since no one knows who he is, it makes it hard to do anything about it. During initial operations on Orion 6, the Legion suffered higher than expected losses within the urban city centers where the colonists had not only better knowledge of the area, but were able to blend into the civilian population as well. Serpent pilots were being lost in quick, close-quarters engagements which needed to be addressed due to the expense (in time and money) of training each cadet. No expense was spared to create a mobile frame that would bring survival rates back into acceptable levels. The result was the XF-13b Grand Naga. A handful of these advanced frames are currently being used by the Black Adders, a company within Viper Division led by Sgt. Uri Reed, a three year veteran with the Serpent Legion. Just recently, Mr. Newman was able to score more Garage Kits for the Mobile Frame Zero Kickstarter. There has been a large amount of demand for them, so if you wanted one go and get it now before they run out again! UPDATE: Garage kits are already sold out! That was ridiculously fast. UPDATE AGAIN: Garage kits are once again available! Although they are $175 now instead of $150. Aside from modifying existing mobile frames in production, the Legion also has it's own mobile frame R&D division with a state of the art research facility on the Jovian moon of Poseidon. These "skunk works" produce and develop new weapons, defensive technologies, mobile frames, and pretty much anything else that can help the Serpent Legion get the edge. Pictured right is one of their most recent prototypes, the XF-13 Sand Naga. The Legion had found a need for a highly mobile artillery platform since their arrival on Orion 6. Equipped with a HE railgun and a superior drive system, the Sand Naga can get into advantageous positions quickly and dish out the punishment once it gets there. Resistance reports also indicate there is a stealth frame in use by the Legion. No photos of the frame have been captured and the engagements with the frame have been at extreme range with no visual contact. Is it thought that these frames may be equipped with some form of optical camouflage. Luckily, there have only been a small handful of encounters with this frame, which means it is likely present in very small numbers.